Welcome to the enchanted Crystal Forest, where magical fun can turn into big rewards! 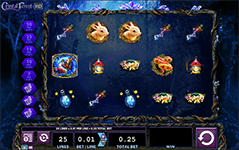 This is the player-favorite Crystal Forest slot developed by WMS and featuring 25-paylines across 5-reels. The Crystal Forest slot is set against a deep, dark, and rich forest background which looks absolutely mesmerizing. There are the invaluable crystals dotting the edge of the slot casing adding to the beauty of this slot. Symbols on the reels include the cute rabbit, a bottle of potion, a lucky lantern, the mystical unicorn, a magical wand, various plants and mushrooms, a WILD symbol and a Jackpot symbol. Crystal Forest really is a thing of beauty. The Waterfall Wild and can only appear on reels 2 through to 5. The Garden Gnome can be used to substitute all the other symbols to create a winning combination whenever it appears. There is also a special Jackpot symbol that awards you the top payout of this game. For you to be awarded with the top payout of the game you need to land 5 Jackpot symbols in a line. This game also features Cascading Reels. Whenever you have a winning combination, the total win amount is paid, and the symbols that form the winning combination explode into pixie dust while new symbols from above drop into their place. This acts similar to a respin in the way that it gives you an extra chance to win more without depositing more coins for that spin. Crystal Forest has a free spins feature where you will trigger Free spins when you hit a minimum of 4 consecutive cascades. You will earn between 7 and 50 free spins for between 4 and 8 consecutive cascades, respectively.